Activity Theory was originally developed by Russian psychologists; first and foremost Vygotsky and Leontjew. Activity Theory is a descriptive, theoretical framework; it provides a terminology and structure for thinking about human activities, taking some particular philosophical stances. Activity Theory explores human activities; it explores “practice”, how things are done. As computer technology pervades humans´ lives; having come out of the laboratories and backrooms since quite some time now, human-computer interaction becomes relevant – with the actual usage, usefulness, and integration of techology into the practice of humans taking an important place in HCI discourse. Activities are the central unit of analysis and thought in activity theory. An activity is directed towards an object or objective. The object is what is created or manipulated in the activity; it is also what motivates the activity. The object describes, or constitutes, the problem space. An activity is carried out by a subject; and the subject is aware of the activity and the object. If a subject is not aware of the object(ive), it is only a participant; but every activity has a subject. Activities are differentiated by their subject, and their object: If two activities look the same but have different object(ive)s, then they are not the same. If I am walking fast along the street in order to get fitter; and you are walking fast along the street in order to reach the train in time; these are two essentially different activities. Human agency: Activity theory takes a very strong stance in seeing a conscious agent, a subject, as responsible for an activity; as driving it. It is not systems that interact, but humans that act and interact with each other. This contrasts for instance with theories of distributed cognition but also Luhmann´s theory of cognitive and social systems. The environment exists on its own and is meaningful; it is not only our brains who somehow construct reality. This is a different approach than taken by constructivism, where meaning is constructed by and within the human mind. Unity of activity and consciousness: Consciousness evolved to help humans survive in a real environment. Consciousness may drive actions in the real world; but it is the real world and the actions in it that count; not the consciousness itself. Remember – the theory was created by psychologists; but they do take the stance that it is not interesting or relevant to think in terms of what happens inside humans´ brains, except for when it is realised as actions. Tools mediate activities, i.e. change essential qualities of the activity; tools shape activities. 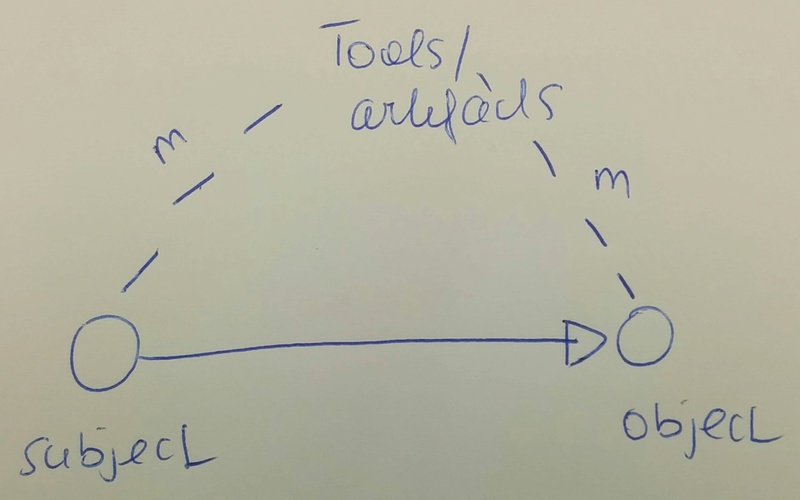 Tools are sometimes also called “artefacts” in activity theory literature. Tools can be both internal tools, such as concepts, factual or procedural knowledge (methods!) or external tools such as physical objects (e.g., a hammer, a book) or digital resources (e.g., software, documents). Development processes are inherently included in analysis: Tools contain a historical development process; they are condensed human experience and knowledge. We stand on the shoulders of giants in our activitie by using tools and artefacts that not we ourselves have created. Activities > actions > operations: Activities are broad patterns directed to an overarching object(ive). In order to realise, create, manipulate an object(ive), the subject carries out a sequence of actions. Every action has a particular goal, which contributes to reaching the overall objective. Actions are operationalised as operations – operations heavily depend on a given situation. Internal and external are mixed: Activity theory consistently combines rather than separates the internal and the external aspects. Tools can be both internal, conceptual as well as external, physical. Objects and objectives, too, can be both internal, conceptual (writing my thesis) as well as external, physical (sculpting a statue). To understand human computer interaction means to understand activity: What is the object(ive)? What is the level of interaction; i.e. does a tool support/accompany an activitiy, an action, or only a specific operation? Computers are tools that humans use to achieve objectives that have meaning outside the human-computer system; and this “environment”, this setting of human-computer interaction is the context given when emphasizing the human activity rather than the human computer interaction. HCI, then, is concerned with integrating computers as tools into human activities, with appropriating computers as tools to serve human object(ive)s.
Computers serve as functional organs – resources (tools) that enhance humans´ capabilities by providing / externalising functions. Books (the traditional ones) do the same by providing “external storage”; so we should think about what assistance computers can offer us, instead of what tasks computers can “take over” in order to “maximise” human experience of life. Collaborative practice is conceptualised in activity theory by relating the subject of an activity to a community. This community again consists of conscious subjects; and a community is defined as subjects who have the same object(ive)s.
The relationship between the subject and the community is mediated by rules; as tools and artefcts, also rules inherently contain the result of a historical development. 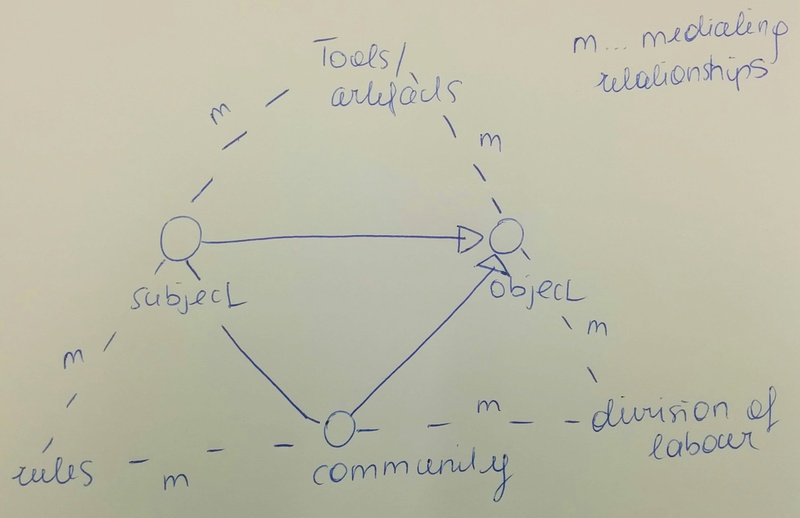 The relationship between the community and the object(ive) is mediated by a division of labour. Also the division of labour contains the result of a historical development. This entry was posted in Ongoing Research and tagged activity theory, chi, theory, work analysis on August 19, 2015 by viktoriapammer.